We Design Textiles are participating in knit show 2018 at velan hotel, Tirupur from 5th August to 8th August. Pls visit our stall for Tapes, Ropes, Drawcords. 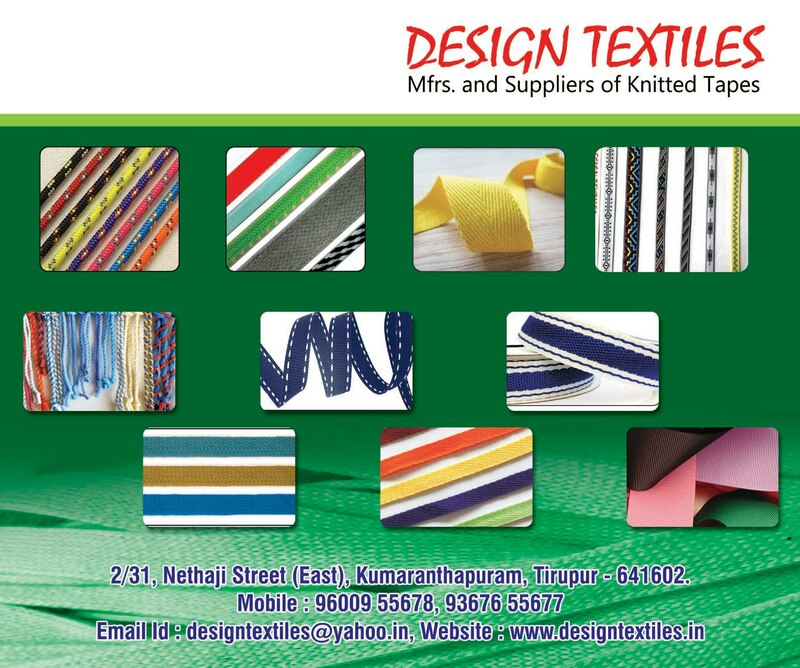 Pls contact us 9367655677 and email your requirements to contact@designtextiles.in and visit our website www.voguesourcing.com Design Textiles is Manufacturer, Supplier of Knitted Tapes, Tapes, Twill Tape, Herringbone Tape, Grosgrain Tape, Cotton Tape, Polyester Tape, Raschel Tape, Knit Tape, Garment Tape, G Tape, W Tape, V Tape, Stripes Tape, Jacquard Tape, Name Tape, Logo Tape, Furniture Tape, Cotton Knitted Tape, Polyester Knitted Tape, Neon Tape, Coloured Tape, Plain Tape, Garment Trims, Woven Tape, Elastic, Rope, Twisted Rope, Braided Rope, Tubular Rope, Tassels, Flat Rope, Twist Rope, Drawcord. our tape & rope manufacturing factory located in Tirupur, Tamilnadu, India.